Name of a the child plays very important role in his upbringing life. Once Rasoolullah (Sallallaahu Álayhi Wasallam) called for a volunteer to milk a camel. Four persons volunteered: he refused to accept the services of the first three because their names did not imply pleasantness. The names of the first two were Murrah (bitter) while Jamrah (burning coal) was the name of the third person. When the fourth said his name is Yaeesh (long life) Rasoolullah (Sallallaahu Alayhi Wasallam) said to him: "Milk her." The prophet (Sallallaahu Álayhi Wasallam) was very particular about it. The Prophet (Sallallaahu Álayhi Wasallam) has suggested names of the Prophets or Abdullah and Abdur Rahman. HADITH: "On the Day of Qiyaamah you will be called by your (own) names and the names of your fathers. Therefore keep good names." Aboo Dawood. HADITH: "To whoever is born a child, the child should be given a good name and sound education. And when he becomes of age he should be married." 1. Every child (person) should be identified by his/her father’s name. 4. 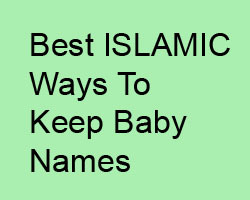 Avoid prohibited Names like Rabah, Najih, Aflah, Nāfi and Yasār.